Gerry Wilson’s story “Wives” will appear in the October 2011 issue of Good Housekeeping. “Wives” was a finalist in the magazine’s short story contest in 2009. Gerry participated in Jane Hamilton’s novel workshop at Writers in Paradise 2011. Her novel-in-progress, workshopped with Ms. Hamilton in 2011, was also selected for “Best Of” honors. That work will appear in the 2011 Volume of SABAL (The Best of the Eckerd College Writers’ Conference: Writers in Paradise) when it is published this fall. Eckerd College Writers’ Conference: Writers in Paradise, alumna, Sanderia Faye Smith, will have an excerpt of her novel-in-progress, “Mourning Bench,” published in an anthology compiled by The University of Arkansas titled: ARSNICK: The Student Nonviolent Coordinating Committee in Arkansas. The anthology is due out tomorrow, Saturday, July 9, 2011. 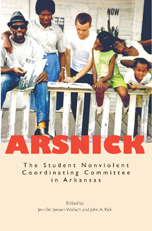 Sanderia will also be moderating a panel tomorrow as the AR Civil Rights symposium presents: “Sit-Ins, Freedom Rides, and Beyond: Direct Action and Civil Rights in 1960s Arkansas” on Saturday, July 9, 2011, 9:00 am to 6:00 pm at the Mosaic Templars Cultural Center at 501 West 9th Street in downtown Little Rock. The symposium will be free and open to the public. An excerpt of Sanderia’s novel-in-progress, “Mourning Bench,” was selected for BEST OF the 2011 Writing the Middle Novel Workshop at the 7th Annual Eckerd College Writers’ Conference: Writers in Paradise and will be published in the 2011 Edition of SABAL later this year. You are currently browsing the Writers in Paradise Alumni blog archives for July, 2011.